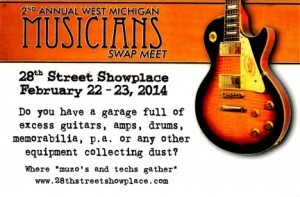 On Stage Services and Speaker On A Stick will be onsite at the 2nd Annual West Michigan Musicians Swap Meet with a variety of things to see, buy and trade. Were also hosting the auction on Sunday! Stop by and see us. We will be there with a Speaker On A Stick sound system setup to demo, answer questions, and it will be used for the auction Sunday afternoon. Buy used equipment, tubes, parts, gaff tape, and all kinds of show accessories at swap meet prices. If you currently have our rental equipment and have questions after our business hours or need immediate assistance, please send an email to carl@onstageservices.com. If your matter isn't as pressing, you can reach us at (616) 988-9671. If it's after our business hours or over the weekend, you must leave a voicemail for us to be notified that you've called. Once we're notified, we will return your call as soon as possible.